Today Swaragini 24th December 2015 Episode Written Updates : The last night episode of “Swaragini” starts with Ragini meeting the community people and says she can’t give time to Swara and she have to go. When the community men asks Ragini why she is hurrying up to throw Swara out from the house. Despite Swara is her sister. About this Ragini says Swara is wrong and she will do justice to everybody and Ragini thinks Swara need to go from the Maheshawari house anyhow. Swara packs her stuffs and bags and she cries. Swara actually don’t want to leave her in-laws home. Sanskar turns his face from her. Swara cries and recalls her sweet and happy moments with Sanskar. She walks towards hall with her stuff…She drops her luggage on floor and runs to hug him. She says I love you Sanskar……..and cries. She says I don’t want to leave you Sanskar, please stop me…….Sanskar remains untouched and unaffected. But in secretly Sanskar hurts and he….don’t want Swara to leave but he is unable to do anything. Suddenly Swara’s Mangalsutra gets stuck on his suit. Swara try to take her Mangalsutra out, meanwhile, Sanskar leave the spot. In this process Swara’s Mangalsutra breaks about which Ragini said that even god doesn’t want you and Sanskar to be together. Swara meet and greet with everyone and try to go. Uttara doesn’t want Swara to go everybody cried. In process Swara promised to everyone and herself that she will be coming back to the Maheshwari house. Swara also promised that she will be coming to making all wrong things right. Now Swara comeback to home and her parents got anxious to see so. Swara’s parents try to console her but it is difficult for them to console Swara. In tonight episode it will be shown that Ragini will be seen happy to drive Swara out from Maheshwari house. She also taunts Annapurna that she, Uttara and Sujata have to do all household chores to stay in the Maheshwari house. Ragini also throw water on Annapurna’s face about which Lakshay got angry and hold his hand but still Lakshay is unable to do anything. 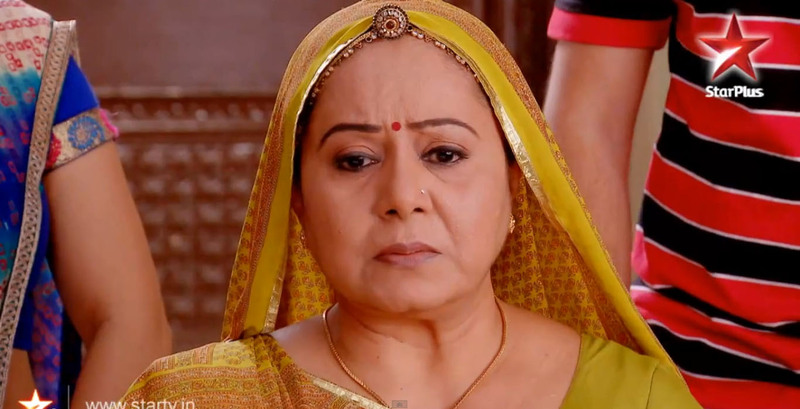 Star Plus Diya Aur Baati Hum 24th Dec 2015 Episode Bhabho Gets Life Time Imprisonment!